The Cassini spacecraft orbiting Saturn is maneuvering into place to take pictures of Earth. The picture taking will occur between 21:27 and 21:42 UTC on July 19. Cassini will be nearly 1.5 billion kilometers away from Earth. NASA is encouraging the public to look and wave in the direction of Saturn at the time of the portrait and share their pictures via the Internet. The Cassini Earth portrait will be part of a more extensive mosaic — or multi-image picture — of the Saturn system as it is backlit by the sun. The viewing geometry highlights the tiniest of ring particles and will allow scientists to see patterns within Saturn’s dusty rings. Processing of the Earth images is expected to take a few days, and processing of the full Saturn system mosaic will likely take several weeks. Cassini’s view is simulated above. Details on how to find Saturn in the sky and participate in the event are available at https://saturn.jpl.nasa.gov/waveatsaturn. The public can share pictures by using the hashtag #waveatsaturn on Twitter or uploading pictures to the event’s Flickr page at https://www.flickr.com/groups/wave_at_saturn. The event’s Facebook page is https://bit.ly/waveatsaturn. Cassini mission scientists will participate in a live Ustream show July 19 from 21:00 to 21:30 UTC at https://www.ustream.com/nasajpl2. Because of the danger of looking in the direction of the sun and blinding a camera, this will be only the third image of Earth taken from the outer solar system in the history of space travel. 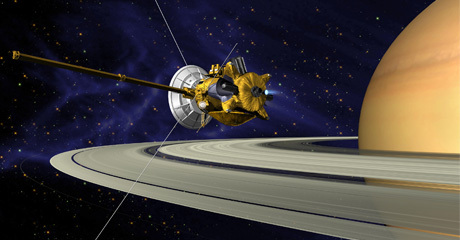 The first was taken by Voyager 1 in 1990 and the second by Cassini in 2006.